The BeJeweler Pro is a precision electric rhinestone applicator for hot-fix embellishments and was specifically designed for use with Swarovski® hot-fix crystals. 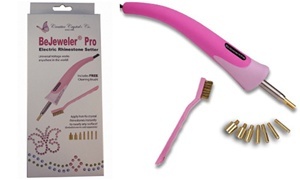 Use the BeJeweler Pro to embellish just about anything - jeans, shirts, dresses, costumes, quilts, purses, hair bows, dog collars and even your cell phone or PDA! 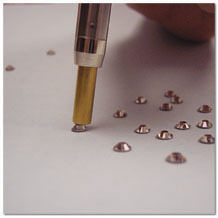 The BeJeweler Pro is simple to use - just place the tip over the crystal and the BeJeweler Pro will pick it up. Wait a few seconds for the glue to melt and apply it to the item to be decorated. And that's all there is to it! Each BeJeweler Pro comes with the applicator, support stand, 8 removeable tips (for applying Swarovski® Hot-Fix Crystals in 2, 2.5, 3, 4, 5, 6, and 7mm diameter, plus a "Hot Spot" tip for applying cut rhinestones, nailheads, etc. ), and a metal cleaning brush. 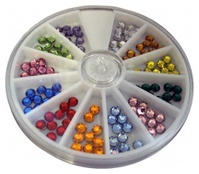 Also included in this package is a 120-piece set of 4-mm Swarovski® hot-fix crystals in a rainbow of colors - you get 10 each of 11 different rainbow colors, plus 10 classic clear "diamond" crystals.